This food-themed programme draws together three distinct themes. Firstly, sacred music whose purpose is the commemoration of the Eucharist, the great spiritual feast of the Lamb of God; secondly, secular music that celebrates the nourishing of the temporal body with various kinds of delicious things; and thirdly, music by composers whose names are, in some sense, edible. Occasionally, these overlap, as in Gallus' setting of Bernard of Clairvaux’ poem Jesu, dulcis memoria; occasionally, the spiritual and the temporal can be described using one set of words with two interpretations, as Palestrina points out in his preface to his Song of Songs settings; and on one occasion, a Biblical theme is updated, as in Rheinberger’s fantasy on the story of Jonah. The alcoholic tendencies of medieval monks are parodied in excerpts from the Missa Potatorum, which draws on the Gospels and the ancient monastic plainsong tradition to depict the debauchery indulged in by certain members of the religious orders. In each half, a piano miniature by Rossini is named after one of the composer’s favourite foods, and at the conclusion of the concert, the Toast pour le nouvel an concerns itself with both the eternal joys of the Blessed Virgin Mary and the quickly-expiring pleasures of sparkling wine. 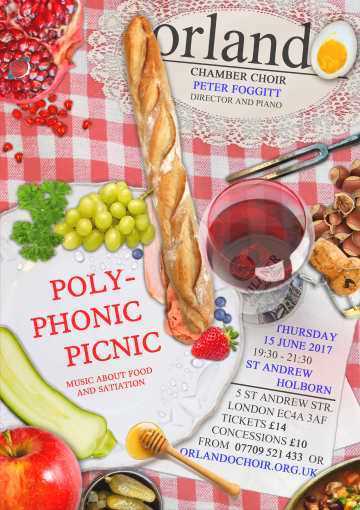 There will be vinum bonum in the interval too, and a variety of foods to complete this all-sensory polyphonic picnic.